Purchase this Daily Getaway deal from dailygetaways.ustravel.org and you will receive 10,000 points deposited in your Best Western Rewards account for $67 OR $60.30 with an American Express Card. You can travel anytime and the maximum amount you may purchase is 5 sets of points. You may spend points towards free room nights at Best Western hotels across the globe. Redeem Free Night Vouchers at any of our participating Best Western hotels worldwide. If you are not a member of Best Western Reward points, then what are you waiting for? 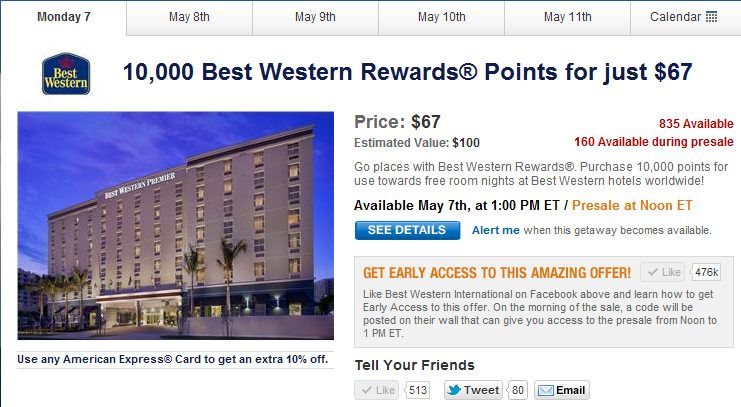 Go sign up today to take advantage of this offer!www.bestwesternrewards.com. 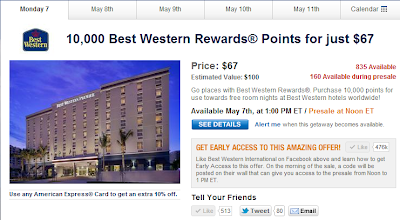 What can I do with Best Western Rewards Points? Go places with Best Western Rewards®. Use points towards free room nights at Best Western hotels worldwide! Give the gift of travel. Redeem points for a Best Western Travel Card, The Gift That Takes You Places®. Go on a shopping spree! Use your points for gift cards at a variety of stores, including AMC, Best Buy®, Home Depot®, Target® and more. Bon Appétit! Use points toward gift cards to your favorite restaurants, including Applebee's®, Chili's® and Olive Garden®. Redeem points for gas cards and car rentals with Avis®, Petro-Canada® and Shell®. Fly away to your favorite destination by using your points toward air travel with one of our global airline partners. Let your rewards thrill you! Redeem points for tickets to amusement parks such as Adventure Island®, Busch Gardens® and Sea World®. Put your rewards to good use. Donate points to one of your favorite charities or contribution fund including Futura® and the Make-A-Wish® Foundation.